Stir with ice and strain into a cocktail coupe. Twist a lemon peel over the top. Two Wednesdays ago, I ventured over to Brick & Mortar for cocktails. 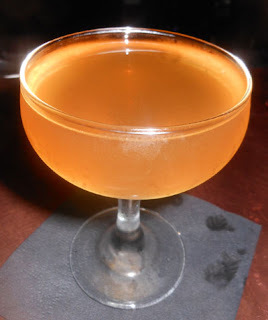 One of the new drinks on the menu, the 10 Cent Loosie, was created by bartender Kenny Belanger during an USBG-sponsored mezcal event which featured a talk given by Misty Kalkofen and a chance to play around with various mezcals. I believe that Kenny mentioned that he developed this one with Del Maguey Chichicapa, but they changed to the Vida to keep the menu price down. He also explained that he named the drink after single cigarettes that used to be for sale in certain stores for a dime, but I am guessing that the days of purchasing smokes for that price are long gone. The lemon oil from the twist brightened the mezcal and herbal aroma. The herbal notes continued on into the sip where it mingled with the Cardamaro's wine, and the swallow proffered the agave, cardamom spice, and bitter notes. Finally, the 10 Cent Loosie finished with a pleasing combination chocolate and smoke.